The collaboration landscapes of our clients were often so complex that we needed to invest too much time to understand their realities. Even when we managed to depict the complexity adequately, our clients often expected solutions to all their challenges simultaneously from one workshop. Additionally, our expectation management was often not as precise as we were used to from face-to-face measures. In summary, we had the feeling that we were lacking knowledge and precision in face of increasing complexity. We (that is Marcus Hildebrandt, Line Jehle from Perform Globally, and Stefan Meister) evaluated our accumulated data and those of other experts on the topic of virtual management. We also sought direct exchange with the two pioneers in the field, Karen Sobel-Lojeski and Jessica Lipnack. Our breakthrough happened when we discovered that there really is one unifying success factor for all virtual work: the degree of perceived “closeness” to teams, groups, networks, their members, and their cause. We all know how it is to feel “closer” to a person or even an organization than to another, even though we have little or no face-to-face contact. Perhaps it is the way an e-mail is written, or may be the manner in which somebody is volunteering to take over task, or the choice of the right media at the right time that conveys that feeling to us. How Can We Measure Virtual Closeness? Over the course of two years we developed a questionnaire, first for pen-and-paper, then web-based, which we then refined through five different versions, always integrating the feedback from customers and external experts. In the course of this, dimensions disappeared, others collapsed, yet others surfaced. It is also possible to compare specific sub-groups with each other or the perspectives of leaders and team members. These results show in a simple graphic form the strengths, but also the areas of potential improvements in the collaboration. To our knowledge no comparable system exists globally depicting the complexity of virtual collaboration so completely. 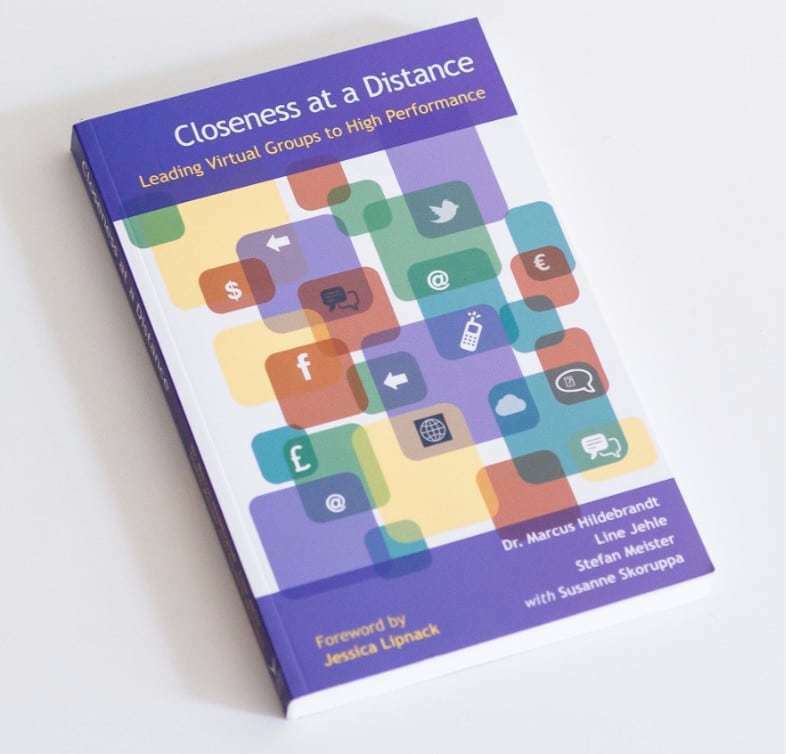 From this research and development and the practical application in the work with leaders and members of virtual teams, our book “Closeness at a Distance” emerged. Its’ title was suggested by Jessica Lipnack herself, who also offered to write the foreword – which we are eternally thankful for. Learn more about VPA®, Closeness at a Distance and our Services to improve the performance of your virtual collaboration. Or directly get in touch with one of our experts. Authored by Dr. Marcus Hildebrandt, Line Jehle, Stefan Meister and Susanne Skoruppa. ‘Closeness at a Distance’ is a groundbreaking approach to the challenges so many teams, and team leaders, face today. Virtual working is now a reality for most professionals, and the winners of tomorrow will be companies that proactively drive the performance of their virtual co-operations. Virtual leadership, project management at a distance and networking are today’s and tomorrow’s critical success factors. “Is your virtual collaboration as successful as it should be?” How to answer this question, and how to improve performance in this key area, is the focus of this book. It introduces readers to Virtual Performance Improvement, VPI© as the gateway to solutions to all key challenges faced by international virtual teams, groups, and networks. ‘Closeness at a Distance’ supports leaders so they perform successfully and effectively in virtual global environments. It guides team leaders, project and network managers, members, and even whole organizations, to areas of potential improvement in virtual performance and will help them turn vital challenges into competitive advantages.